First the breeze came from an unusual direction for Valencia, the South West, then it came in double the strength that most had forecast, hitting 25 knots at times and pushing the boats and their crews to the limits and beyond. But that was just the beginning. In the first match of the day, and one that many believed would be the closest, BMW Oracle led Alinghi around the course to beat the Swiss by 1min 15sec, a big margin. It’s not often you see the Swiss on the receiving end of a delta of this size. 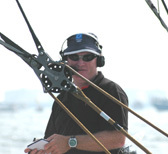 To add to their woes, the normally slick team blew two kites out, broke their vang and jib cunningham. In match two the Kiwis made mincemeat of Le Defi. But the real match and possibly the best of the day, was between K-Challenge and Shosholoza. This was the South African’s best opportunity to score a point in this Round Robin, as a victory over Alinghi in the final match of the Round Robin looked unlikely. Even so, given the confidence that K-Challenge looked to have, the chance of a win here still looked slim for the South Africans here but it was to be their proudest race by far. Trailing the French team at the first weather mark the South Africans decided to go for a gybe-set, a brave move for a young inexperienced team in strong winds, but not only did they pull it off but they spooked the French into a gybe that didn’t go as smoothly as they wanted. The South Africans capitalised on this and gained the lead. At the next weather mark they were still ahead as they rounded for the last downwind leg. But in the shifty conditions Shosholoza went too far to the right, banged the corner and were then slapped in the face as the breeze went further round and left them struggling to lay the finish. This gave K-Challenge the opportunity to close the gap and roll over the top to beat Shosholoza by just 5 seconds. Sickening perhaps that the South Africans had failed to put a point on the board, but deeply encouraging for a team that seem to excel in the stronger breeze and aren’t afraid to throw their boat around. Elsewhere on the race course there were kites blowing out, sheaves exploding, sheets jamming, pole end breaking, mainsails tearing and tempers fraying. OK, the last bit I guessed, but it’s difficult to imagine that there was anything other than a dark cloud over the BMW Oracle crew following their performance against Luna Rossa. The American’s having dealt with James Spithill and pushed him away from the line, found themselves over the line at the start and had to duck back. A daft error given that they were under no pressure from the Italians. After a race that saw them trail Luna Rossa most of the way round, the crew of BMW Oracle managed to squeeze past the Italians on the last downwind leg only to hit the finish mark with a spinnaker sheet. Once again Luna Rossa was nowhere near them. A taxing day for everyone. But if you still don’t believe that this was for real, take a read of Iain Percy’s take on the day aboard their 39 boat. “I think we nearly lost the rig a couple of times,” he said after the race. “One thing I keep on needing to remind myself is that it’s safety first. When you’re in the heat of the battle in these races, it’s about not damaging the boat and more importantly not damaging people. I’m learning this lesson very quickly, particularly coming from small boats where the loads are never so big that they’re dangerous. Maybe not, but we could feel the pressure. More action tomorrow with 20 knots – yummy!